Nearly $10 bln gets spent each year educating undocumented children legally in public schools. Two valedictorians and a Supreme Court ruling shine a light on the human capital being wasted. With employers braying for skilled workers, fixing this policy could deliver big returns. 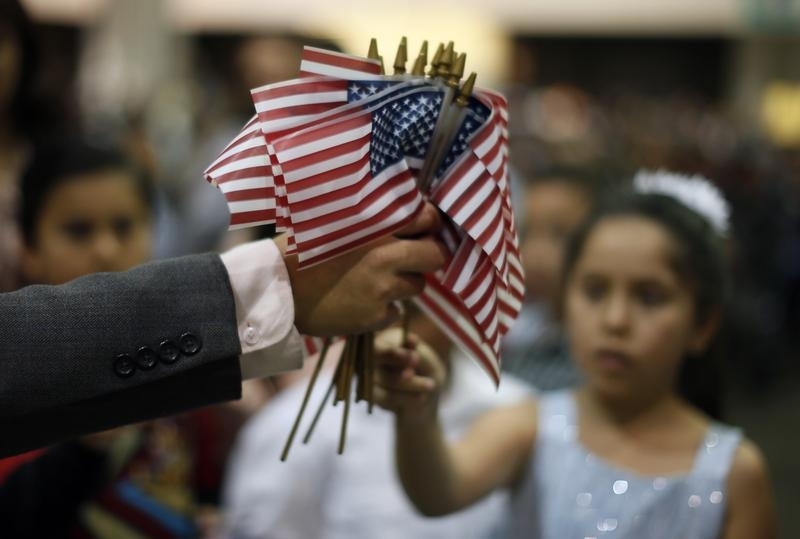 A man hands out U.S. flags at a naturalization ceremony in Los Angeles, California, December 17, 2013. The U.S. Supreme Court on June 23 blocked President Barack Obama’s plan to protect millions of illegal immigrants from deportation. The president’s plan was designed to let about 4 million people with children who are U.S. citizens or lawful permanent residents get into a program – known as Deferred Action for Parents of Americans and Lawful Permanent Residents, or DAPA – that shields them from deportation and provides them with work permits. His plans would have also expanded Deferred Action for Childhood Arrivals, which was originally enacted in 2012 to provide a two-year renewable reprieve from deportation and a work permit for qualified undocumented children. By deadlocking 4-4, the court leaves in place a lower-court ruling that stopped the executive action. “Today’s decision keeps in place what we have maintained from the very start: one person, even a president, cannot unilaterally change the law,” said Texas Attorney General Ken Paxton, whose Republican-led state spearheaded the challenge. Ibarra is due to attend the University of Texas at Austin in the fall while Martinez is set to attend Yale University on a full scholarship. Ibarra qualified for and maintains a so-called deferred action status. Martinez arrived too late to benefit from the program and has been waiting for seven years for her citizenship.